Juana Leon joined The Children’s Trust in 2016. She began her career in public service nearly 20 years ago at the Florida Department of Children and Families and since then has worked her way up the ranks to held various positions within different program areas including district administration, children’s legal services, emergency management and general services, where she was responsible for successful collaboration with governmental agencies, community organizations, contracted service providers and other stakeholders to ensure compliance with statutes, rules and regulations. Most recently Ms. Leon oversaw the general services department providing leadership, planning and vision for the largest district in the state, which encompasses Miami-Dade and Monroe counties. Ms. Leon currently holds a seat in the Emergency Operations Center and is certified through the National Incident Management System/FEMA. 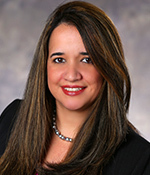 Ms. Leon received a master’s degree in public administration from Florida International University. She and her husband have two daughters.